“Don’t let anybody in the press think that because” President Donald Trump “supported my opponent that I do not support him and support his agenda,” Roy Moore said on Sept. 26 after his victory over GOP establishment candidate Luther Strange in the Alabama primary runoff for the U.S. Senate. “Together we can make America great,” Moore said. “We can support the president. Moore will face Democrat Doug Jones in December in the race to fill the seat of Attorney General Jeff Sessions. 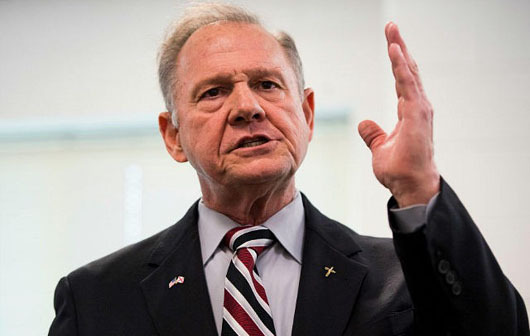 “I believe we can make America great, but we must make America good, and you cannot make America good without acknowledging the sovereign source of that goodness, the sovereign source of our law, liberty, and government, which is Almighty God,” Moore said. Former White House chief strategist Steve Bannon, who addressed the crowd ahead of Moore, noted that the race included $30 million spent by Strange compared to about $2.5 million for Moore. “The question was called today in the state of Alabama, who’s sovereign? The people or the money? And Alabama answered today, the people,” Bannon said. Strange said his campaign “did everything we possibly could” and that he wouldn’t change it.